"When you get home from work, you hardly want a big production for dinner. That's when this recipe can be your standby. 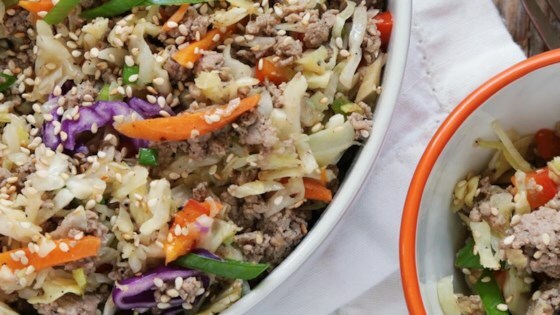 Cook your ground turkey, then add veggies, cole slaw mix, and sauce and in 10 minutes you've got a hearty meal for everyone to enjoy." Mix chipotle hot sauce, rice vinegar, soy sauce, ginger, and agave syrup together in a small bowl to make sauce. Heat olive oil and sesame oil in a wok or large skillet over medium heat. Add ground turkey; cook, stirring to break up clumps, until juices run clear, about 6 minutes. Season with salt and pepper. Transfer to a bowl, reserving juices in the wok. Combine coleslaw mix, red bell pepper, green onions, and garlic in the wok; cook and stir over medium heat until slaw is slightly wilted, 1 to 2 minutes. Add sauce; mix to combine, about 1 minute. Return turkey to the wok and stir until heated through, 2 to 3 minutes. Sprinkle sesame seeds over slaw before serving. Substitute ginger paste for the minced ginger if desired. Substitute white sugar for the agave syrup if desired. Use coleslaw mix with red cabbage and carrots for maximum color and vegetable variety.